Here are three innovative WALKs to explore inner-city Sydney's contemporary art, urban design, heritage and its social context: Green Bans Art Walk, Sydney East Precinct Art Walk, Kings Cross Art Walk & the Rock n'Roll Walk. Linking William and Oxford Streets, running north to south, are Darlinghurst's main streets - Victoria Street and Darlinghurst Road. Darlo Landmarks: Darlo’s preeminent landmark is the spire of St John's Anglican Church (designed by Edmund T. Blacket our great Victorian architect). You might want to visit: the Sydney Jewish Museum (Darlinghurst Road), Darlinghurst Courthouse and in the former goal, the National Art School (one of Sydney’s best contemporary art galleries). If you tire of walking, catch the famous 311 Bus from Darlo Rd (north direction, passes KX Station) or Victoria St (south direction to Central Railway Station). 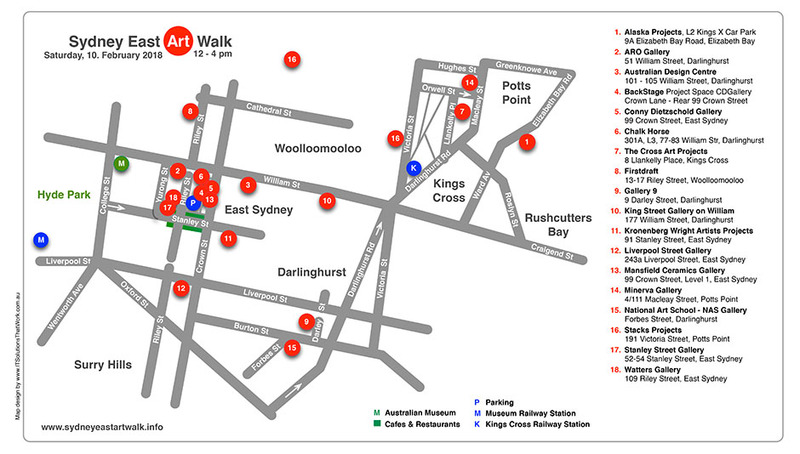 Art Walk is an initiative of twenty prominent contemporary art galleries and art project spaces in the neighbourhoods of East Sydney, Darlinghurst and The Cross. Art Walk is simple. Several times a year (spring, summer, autumn and winter) precinct galleries coordinate an afternoon of art, drinks and food, talks and conviviality. A program of talks links the galleries. 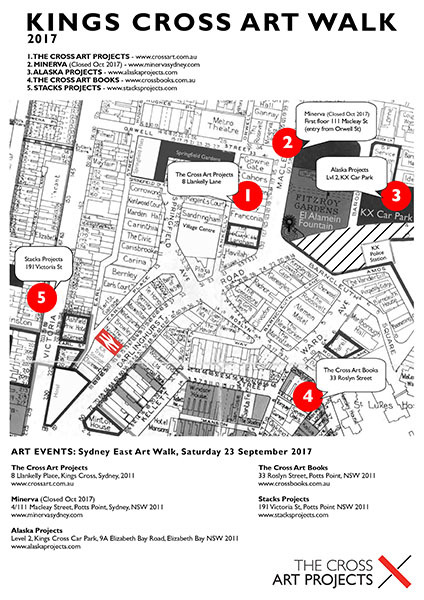 This art walk and the Green Bans website were developed for the Green Bans Art Walk Exhibition in 2011. Presented by The Cross Art Projects, Performance Space, Big Fag Press and The Firstdraft Depot Project Space. The project was opened with talks by Jack Mundey with response by Peter McClelland, president CFMEU and Father Edmund Campion with response by Joe Owens, former BLF secretary. Other talks were by Meredith Burgmann, co-author of Green Bans, Red Union, Catriona Moore and Pam Johnson on 'Art and the Expanded Social Field' and Pat Fiske, director of 'Rocking the Foundations: A history of the Builders' Labourers' Federation' at the Green Bans Film Night Finale, at the Police Citizens Boys Club in Woolloomooloo. True flaneurs might prefer to stroll around four experimental project spaces within 5 minutes of each other in the heart of The Cross. 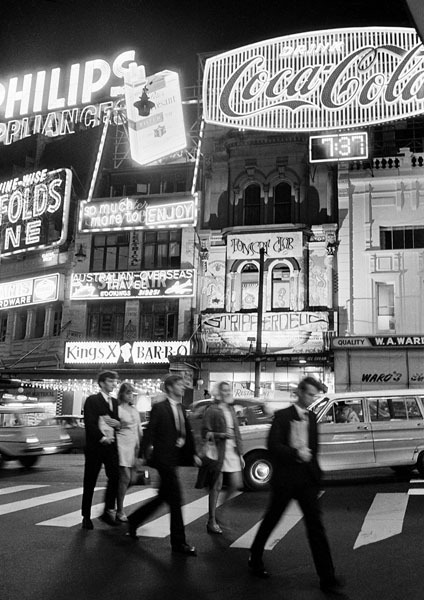 Kings Cross, 1970 at 7.35 pm. Photo by John Fitzpatrick. Courtesy National Archives.